(0 Customer Reviews) | Write Review 4 issues per year Explore the world’s most exciting continent with the only magazine dedicated to travel to Africa. Whether you have never visited or are a regular safari-goer, Travel Africa is packed with inspiration, ideas and advice from top writers, travel experts and photographers to help you to plan your next safari. 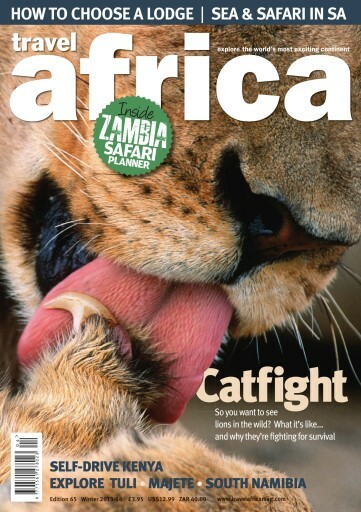 With over a dozen features on all the main safari countries, plus articles on wildlife, culture and history, interviews with guides and conservationists, and sections on conservation and safari planning, Travel Africa is packed with great content on every page. The app has replica pages so you can enjoy the same great design layout as the print edition, as well as text-only and mobile versions to make it easy to read on any device. Additional rich content such as image galleries and video is embedded in the app to allow you to further explore this extraordinary continent. So you want to see lions in the wild? What its like, and why they're fighting for survival • Self-drive Kenya • Explore Tuli • How to choose a lodge • Sea & safari in South Africa • Malawi's Majete National Park... and much more! 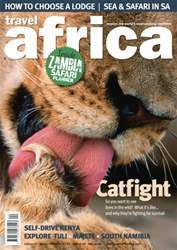 Explore the world’s most exciting continent with the only magazine dedicated to travel to Africa. Whether you have never visited or are a regular safari-goer, Travel Africa is packed with inspiration, ideas and advice from top writers, travel experts and photographers to help you to plan your next safari. You'll receive 4 issues during a 1 year Travel Africa magazine subscription. You'll receive 4 issues during a 1 year Travel Africa magazine print subscription.